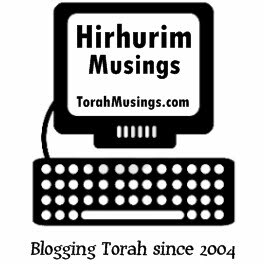 This is your weekly reminder about the July 7th Hirhurim get-together/dinner (link 1, link 2). All readers, commenters and friends of the blog are invited to this free event. That picture you see on the above right is the graphic I submitted to be put on the mugs. The mugs have arrived and below is a picture of one. It's a little blurry but that happens when you use a Blackberry to take pictures. These mugs will be a collector's item. You don't want to miss your opportunity to pick one up for free (along with another trinket). 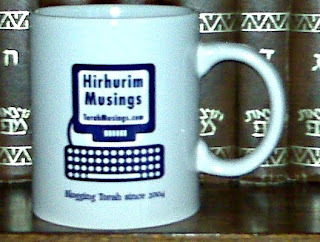 Recall that I will be publishing a special Torah journal for the occasion, which is available to donors wishing to help sponsor the event. The articles are coming in. Recent scholars to submit essays include R. J. David Bleich, R. Aharon Rakeffet, R. Gidon Rothstein and R. Adam Mintz. More to come as the deadline approaches later this week.